We are excited to announce that we will be opening the CUF Archives to our conference guests! Explore CUF’s rich history and view rarely seen letters by H. Lyman Stebbins. 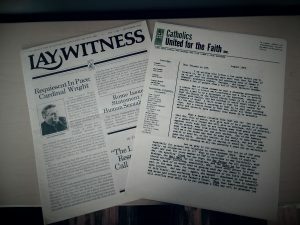 Composed of letters, photographs, early Lay Witnesses and more, the CUF Archives provide a glance into the past work carried out by members of Catholics United for the Faith. ← Conference Highlight: Fr. Joseph Tuscan, OFM Cap.